Claude Archibald Porter was, born in Radford, Notts in 1890, the fourth son of William and Ann (née Leverton) Porter. William, who was born in Asby de la Zouch, and Ann, born in Taversal, Notts, were married in 1870 and for the rest of William's working live they lived at the Station House, Radford, Notts, where William had already been appointed Station Master at the age of 23. It was here that their eight children were born2. By 1911, William had retired to Beeston, to live at Lilac Villa, 62, Broadgate. Initially, Claude Archibald followed his father in finding a job with the railway; in 1911 he was boarding with a family in Keynsham, Somerset and working as a railway clerk. However, in February of the following year, Claude Archibald enlisted in the Army. 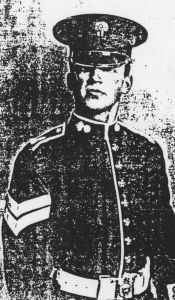 So it was that, on August 4th 1914, the day that Britain declared war on Germany, that Corporal Porter was serving as a regular soldier with the 2nd Battalion Grenadier Guards and was with the battalion at Windsor when War was declared. The battalion was part the 4th Army Division which, although not in turn part of the first wave of the Expeditionary Force which fought at Mons in the first days of the War, it formed part of the 3rd Army Corps which arrived in France around the 25th of August. So, it was during the retreat from Mons that the Guards Brigade saw their first action at the small town of Landrecies5. The short battle lasted six hours with hand to hand fighting in the streets. The major part of the fighting fell to the 3rd Coldstream Guards whose casualties were 170 of which 153 were left in hospital and eventually as Prisoners of War. The next action involving the 2nd Battalion Grenadiers, was to stand and fight at Villers-Cotteretes. At 9am the 4th Guards Brigade which was acting as rear-guard, was overtaken at the village of Soucy where, in according to orders, it was faced about while the 2nd Division was having a two hours halt for rest and dinner. Dispositions were therefore made accordingly. The 2nd Grenadiers and the 3rd Coldstream Guards held the ground from Montgobert to Soucy, with the Coldstreams lining the long grass that runs through the woods at Haramont. They were supported by two batteries of the 41st Brigade Royal Field Artilllery. The 2nd Coldstream and Irish Guards were posted in the rear of the first line, along the northern edge of Foret de Villers-Cotterets, at the base of a ridge known as the Rond de la Reine. The enemy commenced by shelling with such accuracy that the Grenadiers and 3rd Coldstreams were ordered to fall back through the second line and take up a position in the rear. 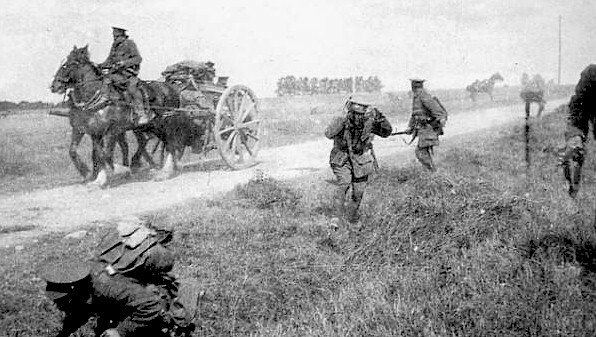 The British Expeditionary then started on their retreat towards the Seine. With the retreat from Mons finally over, the French and British decided to stand and fight. It was here that Corporal Porter possibly died, during the ensuing battle when the Grenadiers went to the aid of the cavalry, who were in difficulties near the Hamlet of Les Groins. Like so many of the deaths inccurred by the British Expeditionary Force, researching the circumstances is very difficult. Even the date is recorded imprecisely, as " between 14th and 16th September 1914" in the Commonwealth War Graves Commission records6. La Ferte-Sous-Jouarre Memorial - La Ferte-Sous-Jouarre is a small town 66 kilometres to the east of Paris, and the Memorial is situated in a small park on the south bank of the River Marne, just off the main road to Paris. The Memorial Register can be found in the Town Hall. The memorial commemorates nearly 4,000 officers & men of the British Expeditionary Force who died in August, September and the early part of October 1914 and who have no known grave. It consists of a rectangular block of stone, 62 feet by 30 feet and 24 feet high, with the names of the dead engraved on stone panels on all sides of the monument. 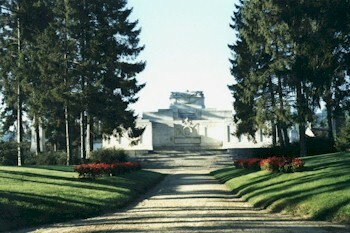 The monument is surmounted by a sarcophagus and a trophy carved in stone. At the four corners of the pavement are stone piers with urns, carved with the coat of arms of the Empire6. 31911 Census Piece 1223 RD429 SD3 ED5 Sched 15. 41911 Census Piece 1223 RD429 SD3 ED1 Sched 345. 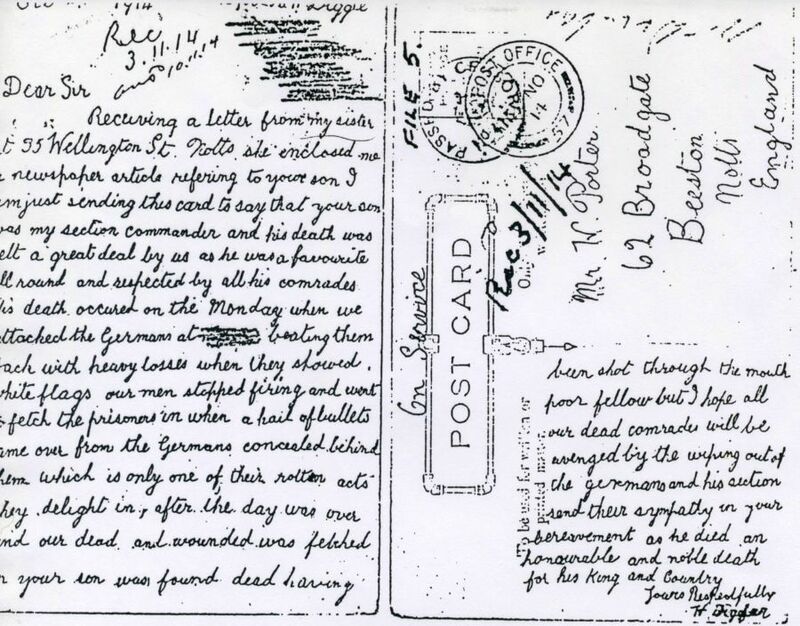 6Evidence from the postcard received by his father, points to the date being Monday, 14th September 1914.